When you're looking to make the transition between a car and an SUV, it might be best to start with a crossover that is a bit of both. The Kia Soul for sale in the Cariboo is just that as a front-wheel-drive, five-door subcompact crossover, providing the perfect blend of car and SUV qualities you're looking for for life in Northern British Columbia. When it's time to do some Soul searching, look to Gustafson's Kia for all your automotive needs. 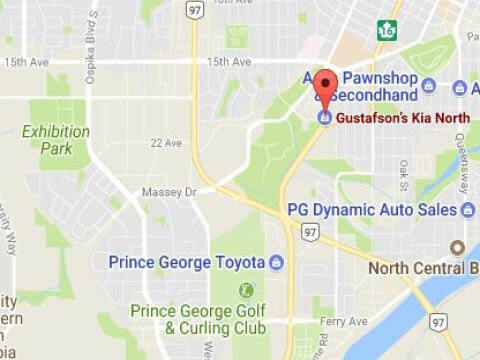 Gustafson's Kia has two convenient locations to choose from in Williams Lake and Prince George, so when you're looking for a Kia Soul for sale in the Cariboo, you've got options. You'll have the advantage of two inventories to choose from for the perfect Soul for you. Let any of our friendly sale team members help you find the Soul that meets you and your family's needs. Visit us at either of our two locations at 112 North Broadway, Williams Lake, BC or call 250-392-2305 or at 1912-20th Ave, Prince George, BC, 250-563-7949. At Gustafson's Kia, we bring you a great selection of both new and used Kia Souls to choose from. Search our extensive inventories in person or browse from the comfort of your own home. Our friendly sales team is happy to help you get behind the wheel of the perfect Soul that meets your needs and fits into your budget. Come in, take a test drive, and let us help you find your Soul today. First impressions are everything. That's why the Kia Soul has a wider, more aggressive styling for the front bumper and grille features. Available silver accents on the rear bumper ensure that you'll get a second glance when you drive past. The dynamic headlight design brings you enhanced clarity and projection when navigating dark roads, especially when combined with available Xenon HIDs and LED daytime running lights. Stand out from the crowd in the Kia Soul. For the ultimate convenience, the Kia Soul for sale in the Cariboo has exceptional cargo space accessible by the rear hatch and standard 60/40 rear seats that can fold down for a more flexible configuration. The push-button start system adds further convenience by eliminating the need to search for your keys thanks to the available Smart Key system. Make long night drives extraordinary with the Kia Soul's panoramic sunroof. Passengers can now enjoy stargazing or simply watching the clouds go by from the comfort of being inside the vehicle. The Kia Soul surrounds you in safety with standard advanced dual front, dual front side, and dual curtain airbags to cushion you and your passengers in the event of an impact. Available safety features such as blind spot detection and autonomous emergency braking do their best to prevent impacts. Blind spot detection notifies you when an object is in your blind spot with an alert while the autonomous emergency braking system provides full braking assistance when it detects a possible collision.